curiosities. Tell good stories. Teach what you know. Don't turn into human spam. Learn to take a punch. Sell out. 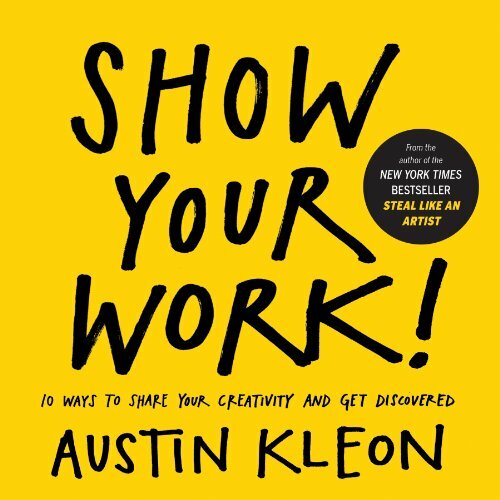 Stick around.If Steal Like an Artist was about how to foster creativity by stealing influence from others, Show Your Work! is about how to influence others by letting them steal from you. It's filled with illustrations, quotes, and stories designed to inspire you to get over your fears of rejection, failure, and vulnerability, and start off on a path of lifelong learning, openness, and generosity. Generosity trumps genius, Kleon writes. Whether you're an artist or an entrepreneur, a student or a teacher, a hobbyist or a professional, it's time to stop worrying and start sharing.